Here are the lateral shots of Paul's left front (which you've seen before!) from the day he arrived, and below, from 2 months later. He's made good progress towards growing a great hoof, and although this hoof is still underrun slightly, as his new hoof capsule reaches ground level his load-bearing will improve again, helped by the fact that he is working the caudal hoof correctly now. The photos show his worst limb, left front, and how much his frog and sole have developed in a relatively short space of time. He still has under-run heels, but lands beautifully heel first, and is rapidly rebuilding the back of his hoof. Andy was sent an interesting article from the Telegraph this week - they had picked up on the barefoot/running shoes debate. There has been research around for a while about modern trainers; Sarah and I talked about it in "Feet First" because there was an interesting parallel with proprioception in horses. Basically, modern trainers are very cushioned and have a tendency to fool the proprioceptive nerves into thinking that you are running on a soft surface even if, in fact, you are doing a marathon on tarmac. The result is that your stride-length and landing doesn't compensate for the hard surface and your joints take the impact - the cushioning in the shoes confuses the proprioception but doesn't protect your joints. By contrast, running barefoot gives you immediate proprioception about terrain - hard, soft, even, uneven - and the body instantly adjusts and compensates. This means that, although there are huge biomechanical differences between people and horses (! ), like a horse, a human runner will land differently on soft surfaces than on hard surfaces. Second plan for this week (no harm planning ahead even though I've not achieved plan 1 yet!) is to try and record the mileage the horses do on the track in a normal 24hr period. I suspect that they cover much more distance on the track than they do out in a field, because when on the track they seem to maintain fitness and muscle so well, even if (like Ghost) they are not in hard work, but it would be nice to find out. I know from experience that a strong wind seems to be one of the things that the horses really dislike contending with. Cold, still weather, or even wet weather doesn't drive them inside and out of the way as fast as the wind, even when its not accompanied by rain. As soon as it drops, though, I will be lashing the Garmin to Felix (as being the horse least likely to break it - it wouldn't last 5 minutes on Charlie, Jacko or Angel!) and we'll see what it shows. I am putting together a DVD for vets' practices and other equine professionals giving an introduction to what we do here and details of Project Dexter. After a lay off of nearly 3 weeks, the gang were back doing what they love, and went hunting today - Bailey, Felix and Charlie, all absolutely thrilled to be out again, and on a perfect day - blue skies, no wind, sunshine, mild temperatures, and everyone - hounds, horses and riders - on top form. One of those special days when Exmoor looks even more beautiful than usual, and when you can be out on your horse all day and not even feel cold once :-) We had a marvellous time and a good fast day - like the horses, the hounds seem not to have noticed that they've had a break, except to come back if anything fitter and keener than before. So just over 21 miles on the GPS, and fingers crossed that the weather stays on our side - for a while at least! There seems to be something about horseshoes which stops even professionals from thinking logically on occasions. I'm still not sure why shoes and shoeing stir up such strong emotions but there is no doubt that they do. Admittedly, there are quite a few barefoot practitioners who make matters worse by being equally blinkered. Its a shame, because it makes it harder for horse owners to rationally weigh the pros and cons of either shoes or barefoot. I came across this quote from a website run by a non-UK farrier who is trying his best to discuss shoeing and barefoot on the same page. "The first myth I really want to dispel is that shoes cause hoof problems. This is the most misleading and false statement I have ever heard." "If you do want to go bare foot there are many things to consider. And don’t think it is easier or cheaper. It takes a greater degree of commitment than shoeing and is a long term project but could be very beneficial to your horses well being. " "I try my hardest to keep my horse’s bare foot as long as possible especially my youngsters... I only put shoes on at the last minute when I really need them...And then it is usually front shoes only"
Shoes CAN be a very useful tool, but they aren't harmless - like anything, there are benefits and disadvantages of using them and its important that farriers are honest about the "side-effects" of shoeing. Barefoot can be a great way to go, but as our friend above has pointed out, barefoot has disadvantages too, not least the amount of effort and commitment required on the part of the owner, and it may not be practical or possible for some owners to improve their horse's hoof health to the point where they can perform to the required level without shoes. Paul's owner came to see him on Sunday and check how he was progressing. She rode Paul and I took Charlie (who was popping out of his socks in an "I'm-hunting fit-but-oh-dear-there-hasn't-been-any-hunting-for-nearly-3-weeks" kind of way). Paul was striding out nicely on the road and behaving like the perfect gentleman he is, and then we hit a long grassy track and some sloping fields which were surprisingly well-drained. Charlie couldn't help but canter - mentally trotting wasn't an option for him so we compromised on a very slow canter :-) Well-mannered Paul was happy to trot alongside, looking very smart and much more like a little dressage horse than a navicular write-off. After crossing one field like this, I decided Charlie had earned a proper canter, and off we went - except that Charlie really wanted a proper gallop at this point - fair enough, and I thought Paul could catch us up at the end. Paul however had abandoned his dressage impression and had moved onto his racehorse impersonation, so the pair of them amused themselves no end by going up the field neck and neck :-) Clare's expression was a picture, especially when Paul didn't break but instead went all the way home with an extremely smug look on his face! Would you expect plastic surgery to make you fitter? Imagine you were overweight, out of shape and had never done any exercise but your New Year's resolution was to get fit enough to run 10 miles by the end of this year. You know that your muscles are weak and you are a bit flabby and you know from watching all that athletics on the telly that runners are lean, fit and toned. So you work out that in order to be able to run 10 miles, your body needs to look a lot different to the way it looks today. Question is, how to change your flabby body into a runners body...?? Suddenly, the answer becomes clear - you need plastic surgery! Brainwave - get rid of all the flabby bits, you'll look just like the runners on the telly and you'll be able to run 10 miles - job done! I think people who have an obsession with trimming are a bit like this - they want to do hoof "plastic surgery" with their trimming - surely if you try and make a weak hoof look more like a healthy hoof, it really will become healthier?! Problem is, expecting a trim to make a hoof healthier is just like expecting plastic surgery to get you fit. If you really want fitness, not just the appearance of it, then plastic surgery isn't the answer and there aren't any shortcuts. Personally, having seen desert hooves, mustang hooves and lots of UK hooves, the one thing I am pretty sure of is that hooves are brilliant at adapting to the surfaces and environment they live and work on. In the UK, that means a warm, wet climate and work on a huge variety of surfaces. Its something we've talked about in "Feet First" as well, but basically hooves like to load centrally, if possible, and to land heel first, if possible, no matter where they live. They aren't always allowed to do that, of course, but if you work a horse barefoot in the UK consistently, and let their hooves follow these 2 golden rules, you will tend to have a healthy hoof with a wide, strong frog which has an active weight-bearing role on hard ground such as roads. Its SO easy for someone to put up a nice-looking website and spout a load of complete twaddle - and if I sound a bit riled about this, its because some of it is not just misguided but actually dangerous. You can't see the author in person (so you can't tell if their head really is spinning round and they are foaming at the mouth); you can't see their environment (so you can't tell if they have driven their entire families to leave home or alternatively have been living in a parallel universe for some years); you can't see their horses (which may or may not be as lame as dogs, wild-eyed and screaming in their own horsey way "please get us out of here"). All you can see is the website, with lovely pictures and plausible-sounding words. I came across a corker a year or so ago, and re-visited it the other day because Sarah B had also come across it, and rang me to say "Good grief have you seen this?!!!". Its a classic - looks nice and happy, if a bit commercial and hard-sell, has some photos of horses mooching about and the words "natural" and "barefoot" crop up all over the place...Which is fine until you see that this person is advocating that the best way to keep a barefoot horse is to trim the heck out of it - not just every 1 to 2 weeks (and for goodness sake, keep those pesky professionals away from your horse - they may be insured and have had years of experience but really, what do they know?) but with power tools every 1 to 2 weeks!! I don't think I've read anything as way off-beam for ages, but even though I know this is bonkers, part of me is still intrigued with how someone who says that they work their horses could find anything which could usefully be trimmed that frequently. The only horses I can think of where a 2 week trim could even be remotely beneficial are severe laminitics - and even then I would be far more concerned about finding out whats the cause of the laminitis rather than trying to trim away the evidence. In fact the only horses I've ever come across personally who were trimmed that regularly were under a Strasser trimmer and were fairly crippled. Sort out their diet, leave them well alone in terms of trimming - no more than every 6 weeks - and build in exercise once they were comfortable, and they became happy, sound barefoot horses. Of course there are some very competent owners out there who trim their own horses...BUT the ones I know (who have the performance horses to prove it) have devoted months or years to learning how to do so, and are extremely conservative in what they do. More importantly, they recognise that the trim is only one small part of barefoot performance and (just like farriers and trimmers who do this for a living!) they tend not to go around advising people over the internet on how to trim, because they realise that its a little bit more complicated than that(!). Romantic fool that I am, these were Andy's Christmas present! He has preferred running barefoot for a while, as it puts much less stress on your joints, but of course unless you spend most of your time barefoot, its hard to develop tough enough feet to cope comfortably with flints, thistles and gritty roads. Meanwhile, Sarah B had been looking at barefoot alternatives for a while, because of her bad back and had found these "shoes" - Vibram Fivefingers, as she's documented on her website! They solve the problem for those of us who don't go barefoot all the time by providing an instant sole callous. Although proprioception is reduced, its much better than normal shoes or trainers, and you have a sensitive yet flexible sole which protects you from the discomfort of small sharp stones, thorns or thistles but gives you most of the benefits of being barefoot. They look a bit mad, but thats half the fun, and they have a fascinating effect on your posture and movement - so much so that you have to break yourself into wearing them gradually to give your muscles and tendons time to adapt! One of the benefits of the recent weather (up here at least) is that we have had much clearer skies than normal. Its been very interesting to monitor the horse's behaviour, especially after dark. Normally we have so many wet, overcast nights that its no surprise that they show a preference for being in the barn - dry, sheltered, lots of haylage! Recently though its been dry and clear for many nights, and what seems to happen is that the horses prefer the barn if its dark, but prefer being out on the track if there is a decent amount of moonlight. Obviously in a normal winter its so cloudy up here that the moonlight isn't that bright, or else when there is a moon its pouring with rain...(!) so its not something I've noticed before. There was a post on the UKNHCP forum a few days ago about a horse which had been barefoot for some years but had weak frogs. The owner had tried lowering the heels by trimming, but actually frog strength is more about correct movement and stimulus. 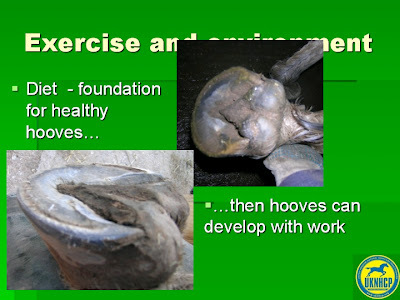 It reminded me that we have often used these 2 photos in talks to farriers and students; they provide a perfect illustration of what makes frogs improve. The right hand photo shows the hoof of a barefoot youngster; his hooves are fine, but under-stimulated because at that stage he was not in work and was just turned out in a field. In the second photo its a different story - he had been in work for 6 months and the frog development is dramatic. He is now a trainee endurance horse, and is clearly landing correctly, heel first, and is moving over all sorts of terrain competently. This is the latest footage of Paul, who has made very rapid progress indeed - he is also in the Snow vid I posted yesterday. He has such a great attitude, and seems really pleased to be back in work and out about about again. More on him later! Bailey, Paul and Ghost enjoying the snow! This a big question for anyone who has or wants to have a performance horse. There is endless discussion about what makes good hooves; foot balance, nutrition, genetics, environment - the list goes on. In "Feet first" we tried to give practical advice based on what we knew was effective for most horses but at the same time we are constantly learning new twists and refining our practices. All this means that if you want to assess whether hoofcare is a success for a particular horse, you have to look at the outcome, not the process. If your horse is capable of a high level of performance, week after week and season after season, and if their level of performance is improving rather than deteriorating, then that horse's hoofcare is a success - simple as that. ...and where horses have gone, dogs can follow! Barney on the track - a bit impassable due to the drifts! What do you do on a Sunday when its too frozen to ride out? Box up and hit the beach, of course :-) Thanks to Ted for taking the photos and the great clip of Bailey, Hector and Jacko having a leg-stretch! Paul a month later, much sounder and back in work. You can see how much hoof he has grown already from the change in angle below the coronary band. He also has an improved hoof pastern axis. I've now uploaded this as high definition footage, which should be sharper! Today's blog is thanks to Sarah Braithwaite, who gave me a fantastic book for Christmas: "Animals in translation" by Temple Grandin. If you haven't come across it, I can highly recommend it - its a seriously worthwhile and totally absorbing read. One of the chapters that particularly interested Sarah and I comes early in the book, and describes the differences between what animals perceive through eyesight and what people do. The author is autistic and says that "animals and autistic people see a whole register of the visual world normal people can't or don't". She describes a study that was carried out with commercial airline pilots, using a flight simulator. The researchers asked them to perform routine landings, and on some of the approaches there appeared to be another plane parked on the runway. It was clearly "visible" but a quarter of the pilots landed right on top of the supposed plane and never saw it. "If you're a professional [pilot], expecting to see what a professional normally would see, there's a 25% chance you'll miss a huge commercial aircraft parked crossways blocking the landing strip in a flight simulator. That's because normal people's perceptual systems are built to see what they're used to seeing... They have inattentional blindness".